The travelling exhibition consisting of contemporary works by authors of predominantely younger and middle generation is the most visible part of the European project, which was designed by six Euroepan partners. The project is coordinated by the International Centre of Graphic Arts (Ljubljana, Slovenia), while its other partners are: Hablar en arte (Madrid, Spain), the Frans Masereel Centrum (Kasterlee, Belgium), the Museum of Modern and Contemporary Art (Rijeka, Croatia), the Foundation Tallinn Print Triennial (Tallinn, Estonia), and the International Print Triennial Society (Krakow, Poland). Six curators have been seeking projects that are based on reproducibility, and are creating tension in how we see the present age in which our society works. Selected artists understand graphic art in its broadest sense – as a tool for drawing attention to the state of reality or as means to achieve change. They consciously reproduce and disseminate the content of their work and by doing so they amplify its impact. Therefore, the outlook of such a selection results in all kinds of forms, starting from traditional printmaking, contemporary methods of reproduction, artists’ books, artists’ anthologies, mass-media projects, and so on. The matrix and the print are understood differently in different contexts; this instability and diversity in reception have become their true and actual state of being. Curators were free to choose the topic that reflects the actual reality of their society. What is vital, however, is that the answers express their own cultural and institutional experience. In such a way, the plurality within art is demonstrated and contents that work synergistically or are mutually exclusive are obtained. Either way, they all reflect the European reality. bolwerK, Paul Hendrikse, Damien De Lepeleire, Lieven Segers, kustosinja/curator Sofie Dederen. Kristina Restović, Emanuela Santini, Celestina Vičević, Iva Gobić Vitolović, kustosinja/curator Daina Glavočić. Joonmeedia, Triin Tamm, Anna-Stina Treumund, Anu Vahtra & Nam Kim, kustos/curator Jaanus Samma. Marta Kubiak, Paweł Kwiatkowski , Marcin Pazera, Rafał Śliwczyński, kustosinja/curator Marta Raczek-Karcz. Boštjan Čadež, Jon Derganc, Tanja Vujinović, Klemen Zupanc, kustos/curator Božidar Zrinski. Pedro Luiz Cembranos, Àngela Cuadra, Àngel Masip, Javier Pividal, kustos/curator Javier Martín-Jiménez. Opening of the exhibition on Wednesday, 17 April 2013, at 7 p.m., at the International Centre of Graphic Arts. The exhibition will be opened by Mrs. Barbara Koželj Podlogar from the Ministry of Culture of the Republic of Slovenia. 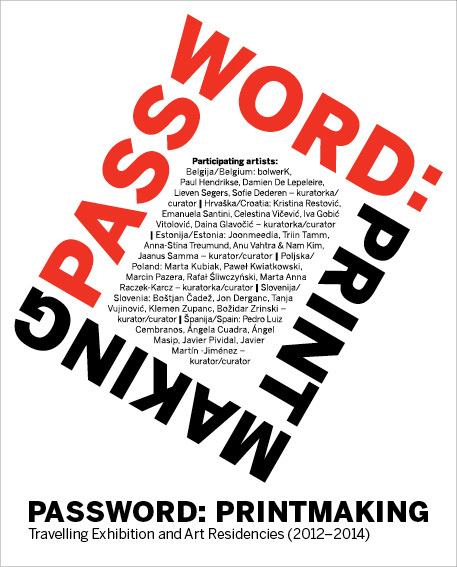 MGLC has published a catalogue to accompany the exhibition Password: Printmaking, Travelling Exhibition and Art Residencies (2012–2014), which bears the same title. The publication includes a foreword by Nevenka Šivavec, an introductory text by Breda Škrjanec, texts by curators, as well as a presentation of the participating artists and their projects.